A South Korean men's doubles ping pong team captured a gold medal at an international tournament on home soil on Sunday. 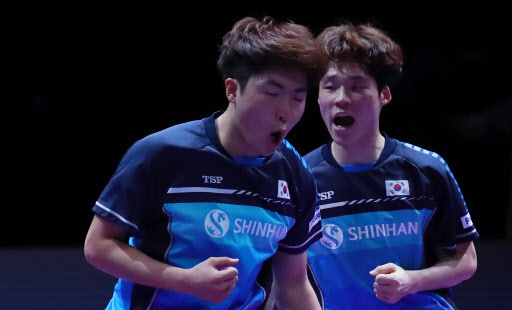 The duo of Jang Woo-jin and Lim Jong-hoon beat Ho Kwan Kit and Wong Chun Ting of Hong Kong 3-1 (11-8, 19-17, 9-11, 11-9) at the International Table Tennis Federation World Tour Platinum Korea Open in Daejeon, 160 kilometers south of Seoul. This was Jang's second gold medal of the competition. On Saturday, he teamed up with North Korea's Cha Hyo-sim to capture the mixed doubles title. They were the only one of the four pan-Korean doubles teams to win a title at the tournament. Jang will go for his third gold medal in the men's singles final against Liang Jingkun of China later Sunday. Jang and Lim opened a 4-1 lead in the first game before closing it out 11-8. In the second game, they led 10-9 before allowing Ho and Wong to force deuce. At 17-17, the South Koreans got two straight points on unforced errors by the Hong Kong team and Lim's powerful drive. They led 9-7 in the third game, two points away from the gold medal, but conceded four unanswered points as the match moved to the fourth game. In the deciding game, Jang and Lim clung to a 10-9 lead, and closed the deal thanks to the opposition's miscue on match point. North Korea sent 16 athletes -- eight male and eight female -- to Daejeon for its first appearance at the Korea Open, contested for the 18th time this year. The Koreas also competed in the same doubles tandems at an international ping pong event for the first time since the 1991 world championships, where they combined for the women's team gold medal. At the world team championships in May in Sweden, the Koreas combined their women's teams for the semifinals. But the team competition then only consisted of singles matches.